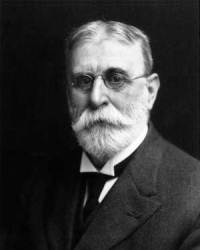 Warfield (1851-1921) was Professor of Didactic and Polemic Theology at Princeton Theological Seminary. Christianity is often called a book-religion. It would be more exact to say that it is a religion which has a book. Its foundations are laid in apostles and prophets, upon which its courses are built up in the sanctified lives of men; but Christ Jesus alone is its chief corner-stone. He is its only basis; he, its only head; and He alone has authority in his Church. But he has chosen to found his Church not directly by his own hands, speaking the word of God, say for instance, in thunder-tones from heaven; but through the instrumentality of a body of apostles, chosen and trained by himself, endowed with gifts and graces from the Holy Spirit, and sent forth into the world as his authoritative agents for proclaiming a gospel which he placed within their lips and which is none the less his authoritative word that it is through them that he speaks it. It is because the apostles were Christ’s representatives, that what they did and said and wrote as such, comes to us with divine authority. The authority of the Scriptures thus rests on the simple fact that God’s authoritative agents in founding the Church gave them as authoritative to the Church which they founded. All the authority of the apostles stands behind the Scriptures, and all the authority of Christ behind the apostles. The Scriptures are simply the law-code which the law-givers of the Church gave it. If, then, the apostles were appointed by Christ to act for him and in his name and authority in founding the Church — and this no one can doubt; and if the apostles gave the Scriptures to the Church in prosecution of this commission — and this admits of as little doubt; the whole question of the authority of the Scriptures is determined. It will be observed that their authority does not rest exactly on apostolic authorship. The point is not that the apostles wrote these books (though most of the New Testament books were written by apostles), but that they imposed them on the Church as authoritative expositions of its divinely appointed faith and practice. Still less does the authority of the Scriptures rest on the authority of the Church. The Church may bear witness to what she received from the apostles as law, but this is not giving authority to that law but humbly recognizing the authority which rightfully belongs to it whether the Church recognizes it or not. The puzzle which some people fall into here is something like mistaking the relative “authority” of the guide-post and the road; the guide-post may point us to the right road but it does not give its rightness to the road. It has not “determined” the road — it is the road that has “determined” the guide-post; and unless the road goes of itself to its destination the guide-post has no power to determine its direction. So the Church does not “determine” the Scriptures, but the Scriptures the Church. Nor does it avail to say in opposition that the Church existed before the Scriptures and therefore cannot depend on them. The point is, whether the Scriptures are a product of the Church, or rather of the authority which founded the Church. The Church certainly did not exist before the authority which Christ gave the apostles to found it, in virtue of which they have imposed the Scriptures on it as law. Apostolicity thus determines the authority of Scripture; and any book or body of books which were given to the Church by the apostles as law must always remain of divine authority in the Church. That the apostles thus gave the Church the whole Old Testament, which they had themselves received from their fathers as God’s word written, admits of no doubt, and is not doubted. That they gradually added to this body of old law an additional body of new law is equally patent. In part this is determined directly by their own extant testimony. Thus Peter places Paul’s Epistles beside the Scriptures of the Old Testament as equally with them law to Christians (II Peter 3:16); and thus Paul places Luke’s Gospel alongside of Deuteronomy (I Timothy 5:18). Thus, too, all write with authority (I Corinthians 14:37; II Corinthians 10:8; II Thessalonians 2:15; 3:6-14) — with an authority which is above that of angels (Galatians 1:7-8), and the immediate recognition of which is the test of the possession of the Holy Spirit (I Corinthians 14:37; II Thessalonians 3:6-14). In part it is left to be determined indirectly from the testimony of the early Church; it being no far cry from the undoubting universal acceptance of a book as authoritative by the Church of the apostolic age, to the apostolic gift of it as authoritative to that Church. But by one way or another it is easily shown that all the books which now constitute our Bible, and which Christians, from that day to this, have loyally treated as their divinely prescribed book of law, no more and no fewer, were thus imposed on the Church as its divinely authoritative rule of faith and practice. Now it goes, of course, without saying, that the apostles were not given this supreme authority as legislators to the Church without preparation for their high functions, without previous instruction in the mind of Christ, without safeguards thrown about them in the prosecution of their task, without the accompanying guidance of the Holy Spirit. And nothing is more noticeable in the writings which they have given the Church than the claim which they pervasively make that in giving them they are acting only as the agents of Christ, and that those who wrote them wrote in the Spirit of Christ. What Paul writes he represents to be “the commandments of the Lord” (I Corinthians 14:37), which he therefore transmits in the name of the Lord (II Thessalonians 3:6); and the gospel that Peter preached was proclaimed in the Holy Spirit (I Peter 1:12). Every Scripture of the Old Testament is inspired by God (II Timothy 3:16), and the New Testament is equally Scripture with the Old (I Timothy 5:18); all prophecy of Scripture came from men who spake from God, being moved by the Holy Spirit (II Peter 1:20) and Paul’s Epistles differ from these older writings only in being “other”; that is, newer Scriptures of like kind (II Peter 3:16). When we consider the promises of supernatural guidance which Christ made to his apostles (Matthew 10:19-20; Mark 13:11; Luke 21:4; John 14 and 16), in connection with their claim to speak with divine authority even when writing (I Corinthians 14:37; II Thessalonians 3:6), and their conjunction of their writings with the Old Testament Scriptures as equally divine with them, we cannot fail to perceive that the apostles claim to be attended in their work of giving law to God’s Church by prevailing superintending grace from the Holy Spirit. This is what is called inspiration. It does not set aside the human authorship of the books. But it puts behind the human also a divine authorship. It ascribes to the authors such an attending influence of the Spirit in the process of writing, that the words they set down become also the words of God; and the resultant writing is made not merely the expression of Paul’s or John’s or Peter’s will for the churches, but the expression of God’s will. In receiving these books from the apostles as law, therefore, the Church has always received them not only as books given by God’s agents, but as books so given by God through those agents that every word of them is God’s word.